Because those things deserve recognition, too, right? So here’s all the things that weren’t sewing clothes. 1. 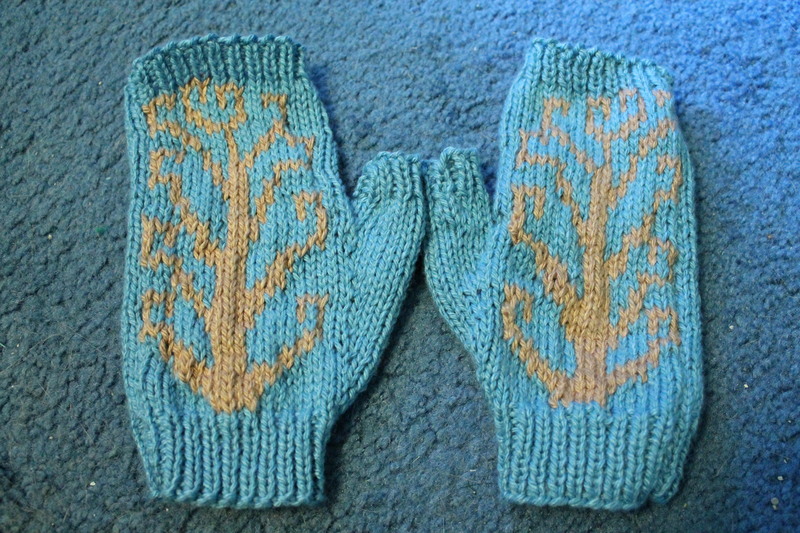 The Branching Out mitts that I knitted. 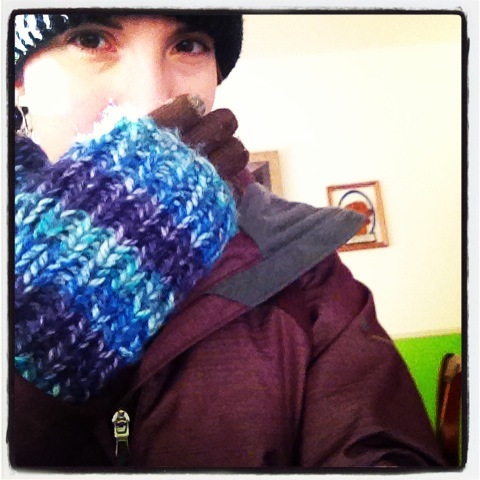 Look, I did colorwork! And they’re soft and cute and from a pattern I already had on hand. And I used the yarn in a fairly timely fashion, so win all around. I did have a bunch of this yarn leftover, but I’m actually using the leftover blue in a current project, which I will blog about when I have more to show for it. 2. 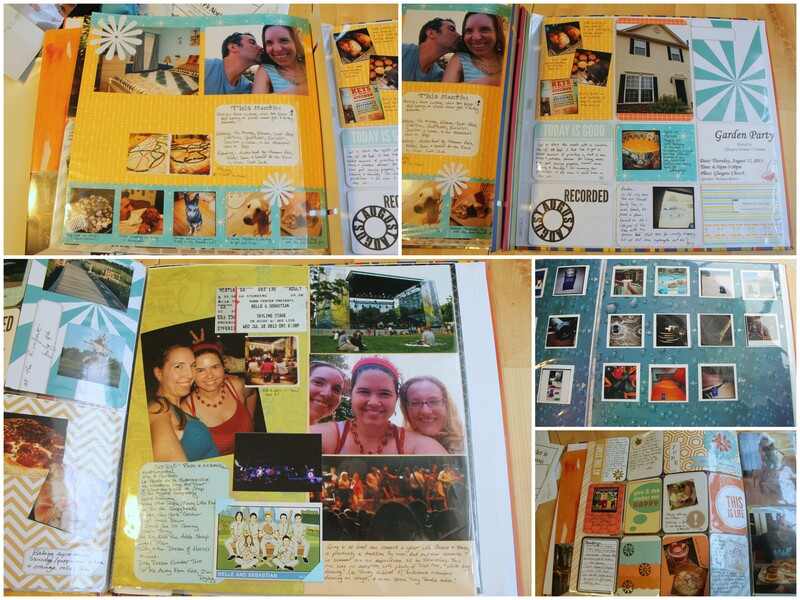 The “Project Life” scrapbooking system. I started playing around with this during the summer as a way to try to stay more on top of my scrapbooking and document newlywed life. For those of you who don’t scrapbook, the basic concept is that you can get these kits with pocket page protectors, cards that fit into those slots, and then you just add your writing and photos and you’re basically done. Most people seem to do one spread a week. I’ve been doing more of a system of add stuff as I have photos for it or things I want to write down, occasionally mixing in more “traditional” scrapbook layouts, and go on a more month-by-month basis. I can’t say I’m caught up, but it really is making it easier to scrapbook on a more regular basis–it’s so easy to just grab the stuff, sit in front of the tv, and see what fits where. I’m also able to use some paper and stuff I already have, just slicing it down to size. I haven’t showed too much of that on here, so here’s a sampling of some things that I’ve (mostly) already gotten done! It’s not all pocket pages, obviously. The top two show what I’ve been doing when I have a “real” scrapbook page on one side–I’ve been making my own cards here and there to coordinate with whatever the main page is. The bottom left-hand corner is a finished page, from a concert that I went to over the summer with two of my closest friends, the bottom lowest right is one of the straight-up Project Life pages, though with a few additional filler cards that I made or printed myself, and the one above that is an in-progress one from the honeymoon. Yes, they’re all Instagram pictures of a little plastic TARDIS. Doug and I were having fun with that! I just need to print out the captions and paste them on, and then that spread is done, and same thing with most of my honeymoon pics. I’ve only gotten stuff through the end of the summer mostly done at the moment, but I’m still feeling much better about this particular hobby than I have for a couple of years! 3. Geeky shoes. 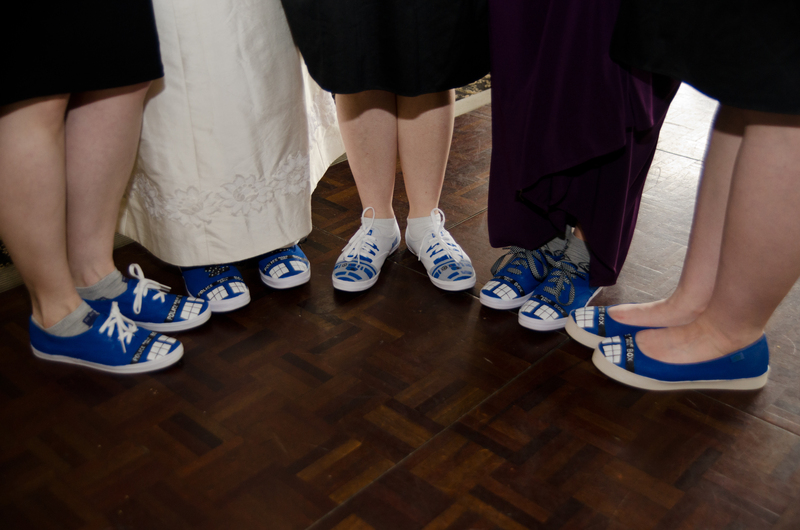 My bridesmaids and mom got a huge kick out of our mostly Whovian shoes for the wedding reception! And I have occasionally worn mine since, though not recently since it’s been wet and icy a lot lately. Not the best scenario for painted canvas footwear. 4. 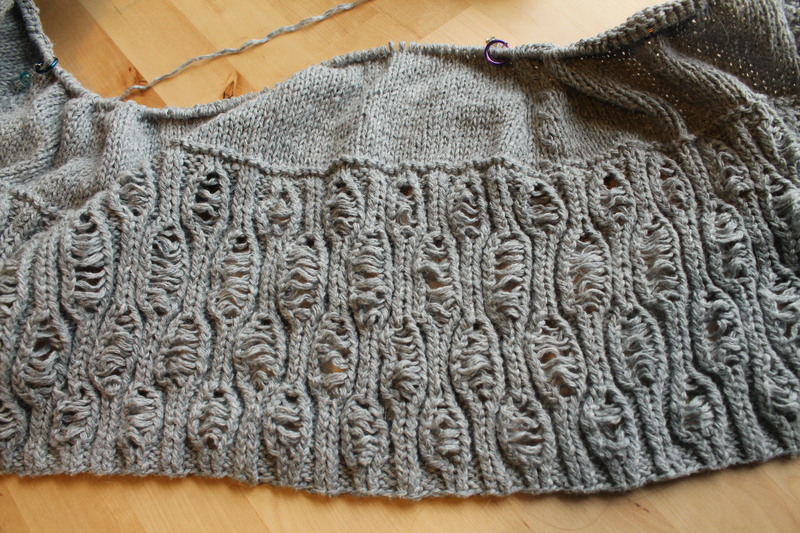 It’s nowhere near finished, but I’m going to add my Roheline cardigan. This is what it currently looks like. I have a long way to go, but once I got past the initial trouble with starting it, it’s been a pretty easy knit, albeit slow. I think my stockinette knitting is starting to look pretty nice and even, which is why I’m calling this a win, even if it’s still in progress! And now that I finally understand what it means by “wrap and turn” on the short row sections, the top will look even better. 5. Making things for others. Yes, this includes sewing too, but I tend to often be selfish in my crafting, and I did make more things that were gifts for other people this year. So that makes me feel pretty good. 1. 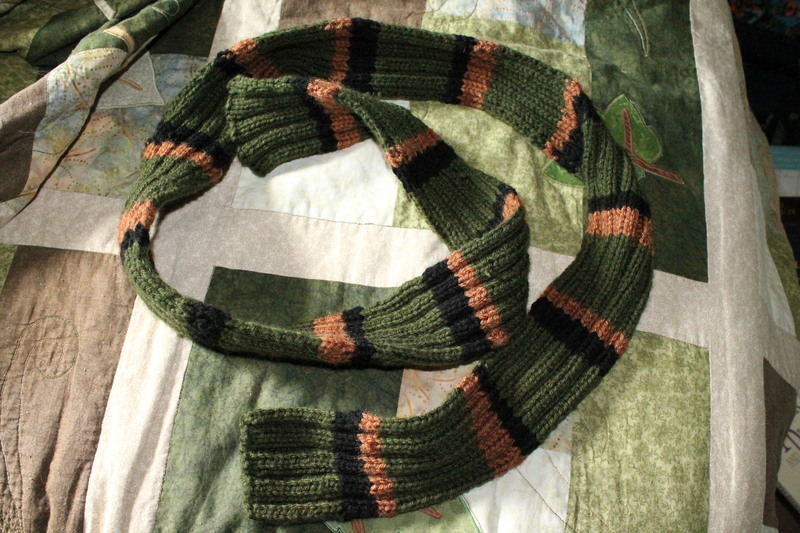 The scarf I knitted for Doug near the end of last winter. It was successful for stashbusting, but he hasn’t really worn it at all so far this winter. This isn’t a criticism, because he does wear the hat I knitted for him in 2012 all the time! He just doesn’t get as cold as I do. 2. The bedroom curtains, to some extent. They do block more light than the blinds do alone, though it still can get way more bright than I like in the mornings. They’re way shorter than I would have preferred. Note to self: Next time, be more generous with curtain yardage estimations. 3. Jewelry-making. Mainly because I just didn’t take the time to do any this year. Note to self: must start playing with beads again, because I have way too many of them not to! 4. Home decor crafting in general. 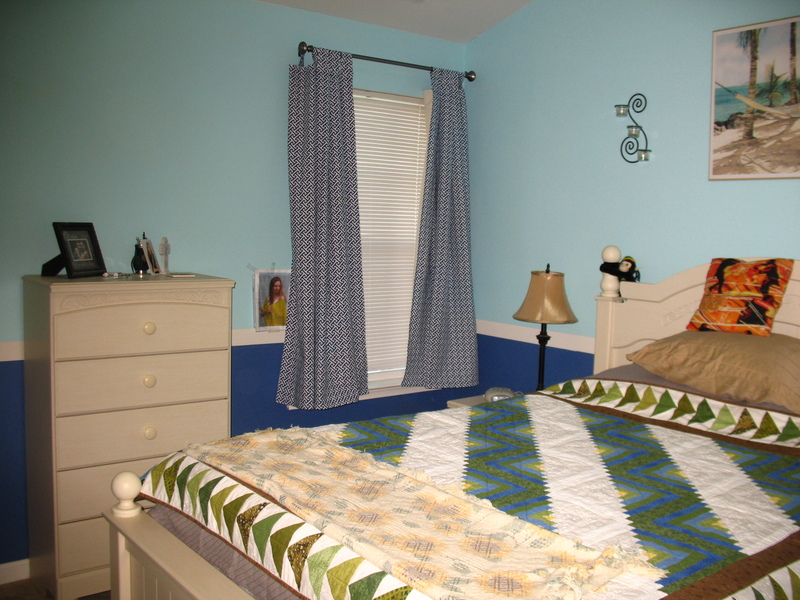 I meant to do a lot more, but once again, time management and I didn’t get along so well, and I only got to the bedroom curtains. 5. Honestly, I can’t come up with a fifth thing, because that more or less encompasses everything I made this year! So let’s just say the time factor and leave it at that, since having more plans than I finished was a running theme this time around. 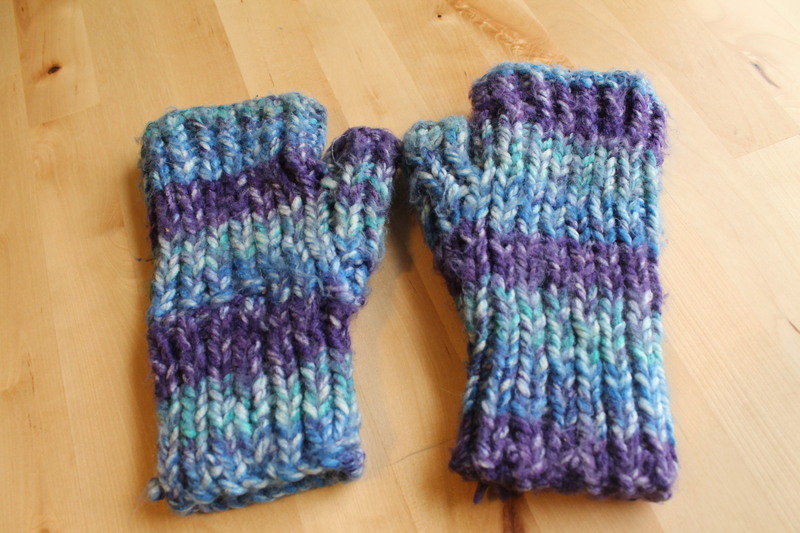 Finally, in the interest of not leaving projects unblogged, here’s the handwarmers I actually finished to wear to my retail job. Yes, those are other gloves underneath. Along with a hat, a scarf, long underwear, at least 2 other shirts, and a 2-layer sporty winter coat. Incidentally, one of the main reasons I still want to sew a new winter coat rather than just use this one, other than fashion, is that the inner layer is fleece, and I’ve found that it’s really, really difficult to pull that on over my sweaters and blazer jackets, on the occasions that I forget to bring my “real” winter coat with me to switch to before I go do my teaching! Aside from a couple of secret projects that I won’t post until after Christmas, and a few in-progress things, that pretty much wraps up 2013! I hope you all have a wonderful Christmas (or whatever you celebrate)! Gosh, when you add these to your sewing, you've been very busy this year! Thanks for explaining Project Life, I've seen it referred to lots but had no idea how it worked!